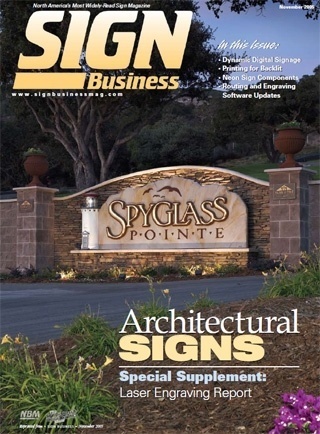 Avila Sign & Design have been featured in many magazines and other types of publications. They are nationally known and respected designers in the sign industry. They were contributing writers with Sign business magazine for over a decade writing many "how-to" articles and also were involved with testing and reporting feedback on industry software and state of the art equipment and hardware. Several magazine covers were photographed by David McDonald who along with his wife Robin is the owner of Avila Sign & Design. Please feel free to read some of the articles posted here to see and understand a little more about the way Avila Sign & Design go about producing their award winning signage and design work. In the articles you will find techniques on Hand painting, three dimensionally carved, gold leaf and many more sign and design techniques developed through years of practice and dedication to the lettering arts and the sign industry.